Each and every one of our donors, from individuals to corporations, allow us to do what we do best – change lives. When we announced we were moving to our new home in the Kahanoff Centre, Husky and Imperial offered a gift-in-kind of unneeded furniture to help us create a space for our clients that was professional, modern and inviting. 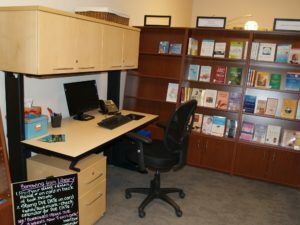 Thanks to Husky and Imperial, Calgary Counselling Centre received desk suites, waiting room chairs, desk chairs, white boards, tables and more. 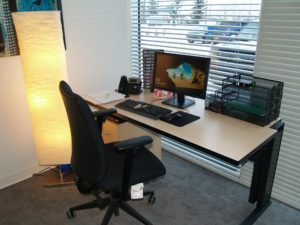 After furnishing our new space, we needed to do something with our existing office furniture. That’s when we decided to pay their generosity forward and we reached out to 15 community organizations including school and youth groups, other non-profits and health charitable organizations to see if they could put any of our furniture to good use. Below is an excerpt from a letter we received from Patti Morris, Executive Director of Wellspring Calgary, who was one of the recipient organizations. At Calgary Counselling Centre, we believe that every person can make a difference, one good deed might not seem like much, but all good deeds spark a cycle of generosity and kindness that helps our entire community. The generosity of the community allows Calgary Counselling Centre to continue to operate with a sliding fee scale and provide counselling session financial subsidies those in need. Thank you again to Husky and Imperial for their significant gifts to improve our new space. Category: About Us, Blog, Counselling, Donors, Miscellaneous.